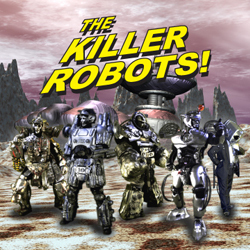 Killer Robots iTunes Debut | The Killer Robots! We are pleased to announce that we have partnered with LA distributor Leomark Studios to bring The Killer Robots! Crash and Burn to audiences worldwide. The movie is currently scheduled to debut on iTunes and other platforms July 15th. It is currently available for pre-order here, and if you live in Japan – here. And just a reminder, The Killer Robots! Crash and Burn movie will be playing at the Super Geek Film Festival during Florida Supercon in Miami, Florida. We will be set up at our filmmakers table the whole festival, so swing by and say hi if you can make it. The film will be playing Friday, July 1st at 11pm and Monday July 4th at 8:05pm. We visited today the Supercon in Miami. Our kids loved the kindness of your robots to make picture with them. The robots were breathtaking and made a real impression thoughout the con. Thank you for the kind words, Alex! We really had a blast. Glad you and your family had fun too!